Could a place like downtown Provo someday be filled with a bunch of pseudo boutiques run by chains like Walmart and Walgreens? I hope not but that’s what Slate’s Matthew Yglesias seems to suggest might happen in this piece. …the underlying issue continues to be secular decline in the demand for brick-and-mortar retail. Yglesias goes on to note that the efforts of chain retailers to move into cities is a result of the “low hanging fruit” of the suburbs being gone. In other words, there simply isn’t anywhere else for these stores to go. This information comes on the heels of the articles I recently shared in this post. It also complicates the picture for places like downtown Provo; if chain retailers are trying to create “experiential” stores that are more like like small shops or boutiques, what will be left for the real small shops? How will they cope? I prefer to adopt a more or less economic perspective on this blog because it tends to be logical and because, in a generally conservative place like Provo, it seems effective. But when it comes to cities, sometimes an emotionally-based argument is equally compelling. For example, The Guardian recently published an angry and emotionally charged reaction to London’s new skyscraper, the Shard. This tower is anarchy. It conforms to no planning policy. It marks no architectural focus or rond-point. It offers no civic forum or function, just luxury flats and hotels. It stands apart from the City cluster and pays no heed to its surrounding context in scale, materials or ground presence. It seems to have lost its way from Dubai to Canary Wharf. Circumstances in Provo are very different, but the gist of the argument is that the Shard is self-centered and doesn’t fit in. That’s basically the same argument people have made about development projects in Provo. It’s beyond the scope of this post to comment on any particular development project in Provo, but the point seems to be that any development should come with civic responsibility. In other words, it can’t just be about property rights and profit. 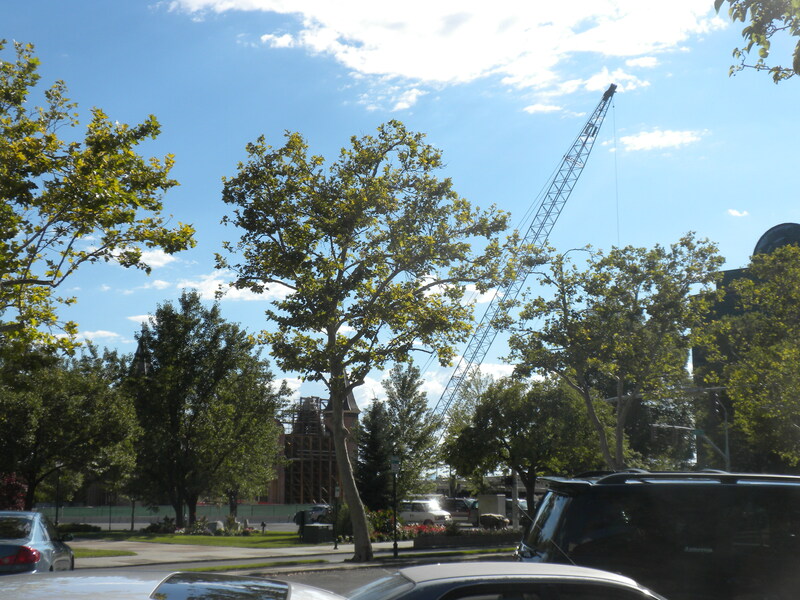 I think a perceived lack of attention to that responsibility — accurate or not — is what infuriates people when new buildings go up, or old buildings go down. The truth is that we have lost the ability to articulate what is beautiful for the purposes of development control. While the small man cannot touch a door frame, the big one can do what he likes, no holds barred. The article is talking about logical, concrete things: planning, zoning, neighborhood conflicts, etc. But the point here is that those issues can’t be boiled down to simplistic ideas like “property rights” or “supply and demand” (though, of course, I boil them down on this blog all the time.) Instead, Jenkins seems to suggest, development needs to be holistic and responsible, even if that means sacrifice or compromise. Though the focus of the article is on age, that passage suggests that friendship is perhaps most influenced by a community’s physical infrastructure. In college, most people live in close proximity to each other — in dorms, small apartments, student sections of their respective cities, etc. — and consequently make closer friends. Unsurprisingly, as people move into less dense communities, they also have a harder time bonding with others. The point is that living in a dense and diverse neighborhood should give people more “proximity” and “unplanned interactions” with potential friends. In other words, city living means the opportunity for more connections with people while, conversely, living in low density areas — e.g. suburbs — should reduce interactions and therefore friendships. Interestingly, the opportunity for frequent interactions is also what helps build a strong startup culture in a city, and was more or less one of the things Jane Jacobs emphasized — albeit with different terminology — when she stressed the importance of lively streets. Of course, there are some limits to this idea. The New York Times, for example, quotes several people in The Big Apple who have difficulty making friends, suggesting that simply living in a big city will not by itself lead to closer bonds. It’s also worth noting that there are different kinds of density. As Jacobs and many others have pointed out, very tall residential buildings often function as vertical suburbs by creating isolation rather than interaction. But the lesson here isn’t that cities are a cure-all for loneliness so much as it is a game of numbers: the more people that are clustered into a small area, the greater the probability a person has of meeting and befriending someone new. Last week I wrote about Amazon’s newest efforts to speed up delivery and how that likely spells disaster for brick-and-mortar retail in places like downtown Provo. But all retail isn’t actually going to die and while researching the topic I happened upon this list of strategies for stealing customers away from Amazon. Like most of information on this topic, the list discusses the retail experience, not cities. But even so, it offers useful insights for making urban retail centers work in the age of the internet. The first point calls on retailers to make stores more than just a place to buy goods. Citing Disney’s attempt to make stores “the best 30 minutes of a child’s day,” the idea seems to be that people should derive a kind of unique pleasure from the retail experience. Besides Disney, Apple strikes me as particularly skilled at this; Apple stores are less about buying things and more about trying out something new. They’re showrooms, which may be the primary function of retail in the future. The second point — making the shopping experience smaller — is particularly applicable because most potential retail spaces in downtown Provo are smaller than those of typical big boxes. 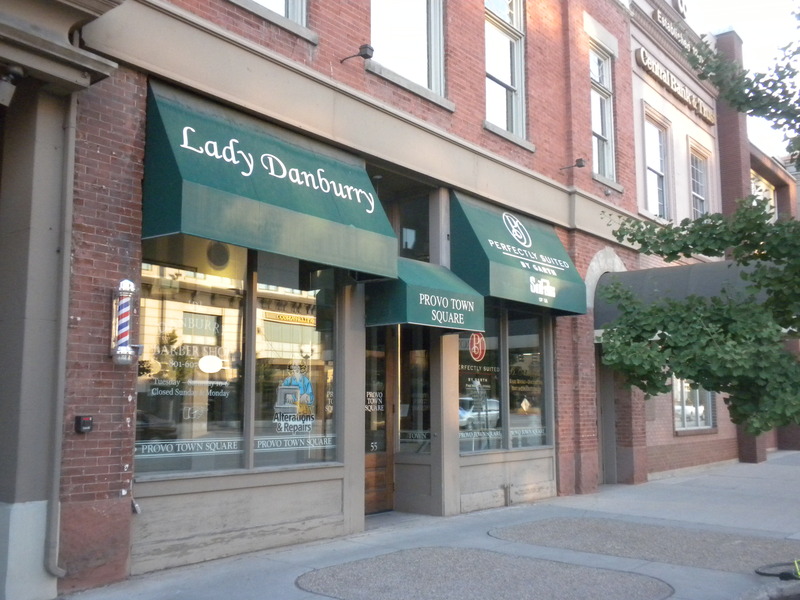 For years, that probably seemed like a disadvantage: downtown stores could stock fewer items and thus perhaps struggled to compete with larger corporations. But today I can buy anything I’d find at Target on the internet. As a result, when I actually go to a physical store I’m looking for a faster, more pleasant and more expert experience. In those areas, small retail may be able to edge out larger competitors. The road ahead for retail is a rocky one, and I’m not convinced that downtown Provo — or any physical space anywhere — is ever going to be a massive retail destination. But if business owners and city leaders think critically about what the internet doesn’t offer, the area may be able to carve out a niche for itself. Small retail spaces are going to have a rough time in the future, but they may be able to thrive by offering experiences that the internet cannot. In comparing May of this year to May last year revenues are up 16.2 percent. According to John Borget, administrative services director, the most significant number is the year-to-date sales tax increase of 6.4 percent. That increase is about $800,000 over last year’s sales tax revenue. The article cites construction and new infrastructure projects with boosting the numbers. The article also points out that sales tax revenues are up in other neighboring cities, as well as the state as a whole. And all of that means more money to reinvest in the community. I suppose my own neighborhood is my favorite neighborhood because I chose to live in it. 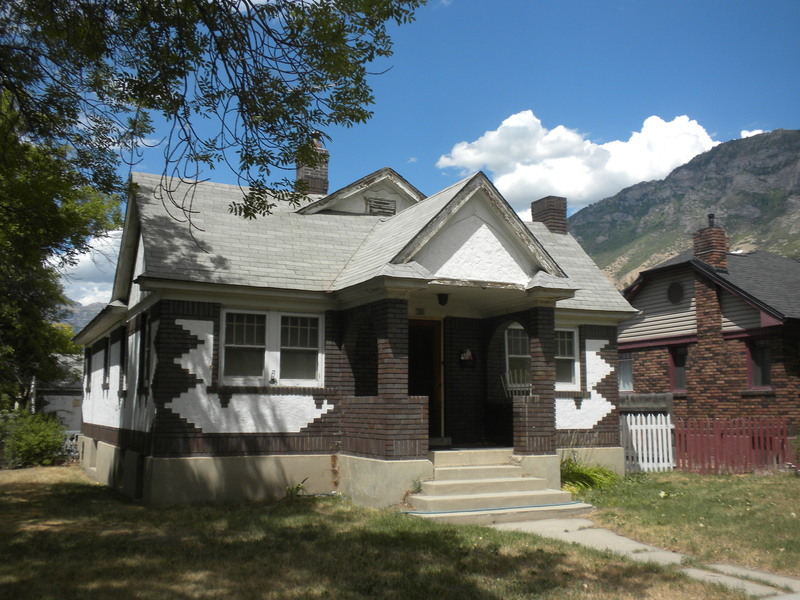 But if I were choosing another area of Provo to call my favorite, it’d probably be the northeast corner of the Maeser neighborhood. I’m thinking of the area just east of 700 East, and immediately south of Center Street. 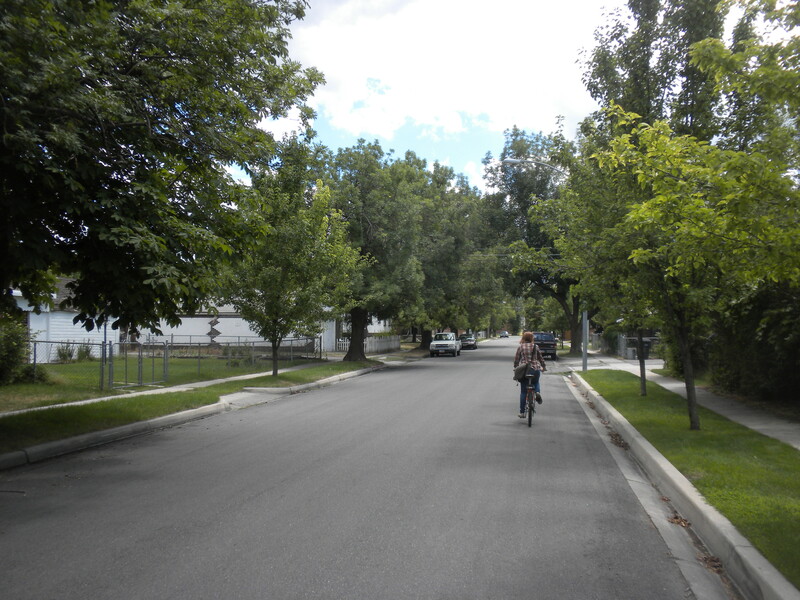 The northeast section of the Maeser Neighborhood may be the best neighborhood in Provo. 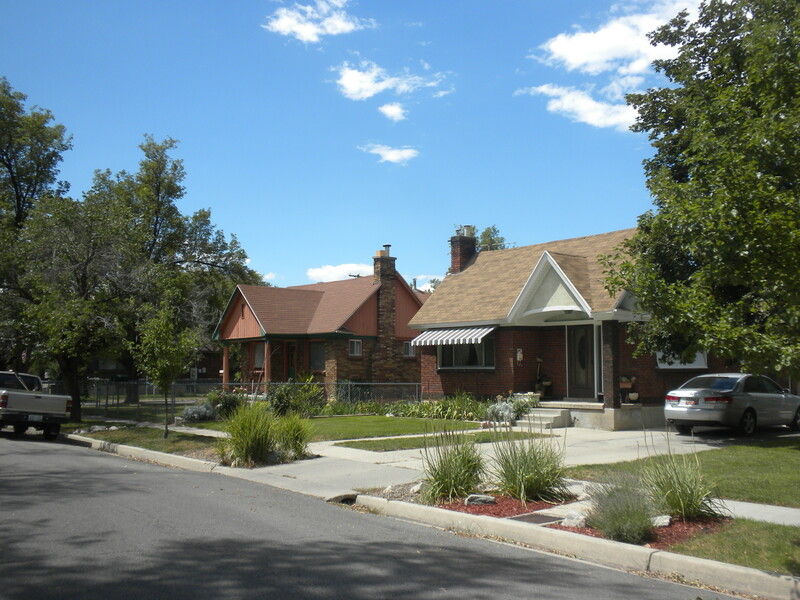 I was recently told by a resident of this area that it was “Provo’s first subdivision.” I wasn’t sure how to officially confirm that fact, but checking county records I found that many of the homes in the area were built in the 1940s or earlier. I also found one house that was built in 1927 and another that is as old as 1922. So it seems the neighborhood came together over a roughly 20 year period. So what makes this area so great? Most obviously, the area is built on a smaller scale than anywhere else in downtown. The streets are roughly half as wide as those in other parts of downtown, and the lots are smaller as well. Narrow streets make for luxurious bike riding. Most homes in this area have relatively small lots. The narrower streets mean less car traffic. What traffic does enter the area also moves at a slower speed. The smaller streets also reduce the amount of undeveloped land — meaning land that isn’t generating tax revenue — which then fills city coffers and cuts down on maintenance expenses. And as anyone who has ever walked down both narrow and wide streets can attest, the narrower ones generally tend to be more pleasant. The smaller lots have similar benefits, squeezing more homes and people into less space. Significantly, they’ve also apparently made it more difficult to alter the composition of the neighborhood. Whereas my neighborhood’s deep but narrow lots have given rise to numerous cheap apartment complexes, the area in these pictures remains almost entirely filled with houses. 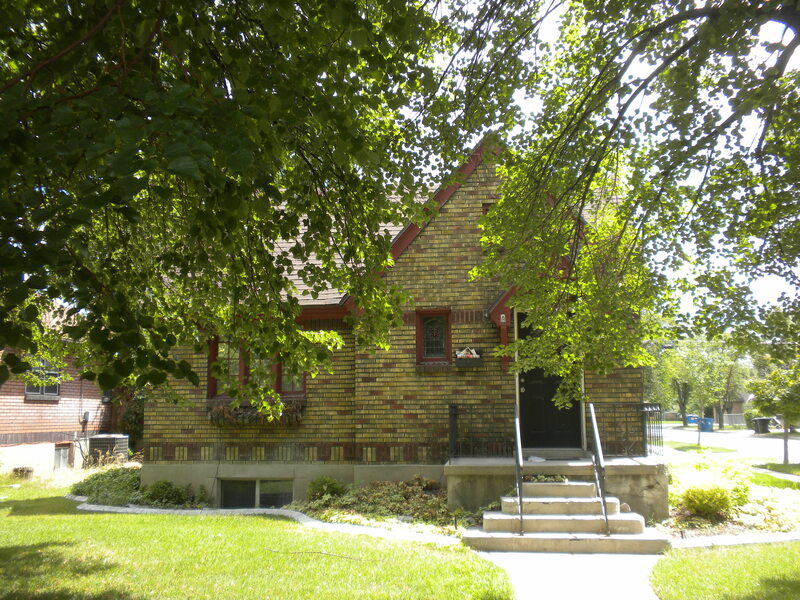 A home in the Maeser neighborhood. Note the stained glass window. Another home in the neighborhood, this time with unusual brickwork. Not all of the homes in this neighborhood are immaculately maintained. In fact, the area does have a slight roughness about it. But that suggests to me that its probably one of the best bargain areas in the city right now. The combination of small streets, charming houses and walkability means this area is a likely spot of future gentrification. 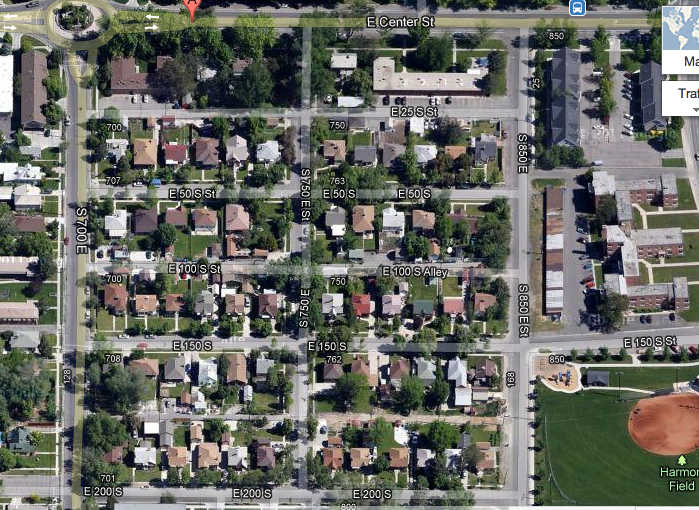 Homes in this area are very near a couple of parks. The neighborhood also has a bunch of other cool features. For example, the driveways often access the homes from an alley running down the middle of the blocks, meaning no ugly garage doors facing the streets, less wasted driveway space, less heat-generating pavement, and convenient unofficial throughways cutting through the blocks. 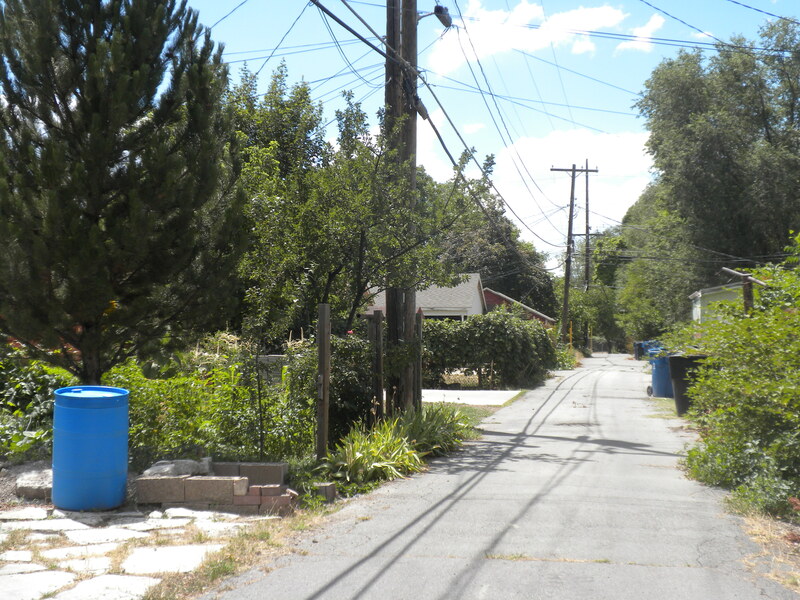 An alleyway cutting through the middle of a block in the Maeser neighborhood. If a neighborhood must be built with car accessibility, this is a pretty great way to do it. A resident of this area also recently told me that garbage pickup still takes place in the alleys, meaning no garbage cans or trash trucks going down the streets. I don’t know why more of Provo’s neighborhoods weren’t developed with this feature. 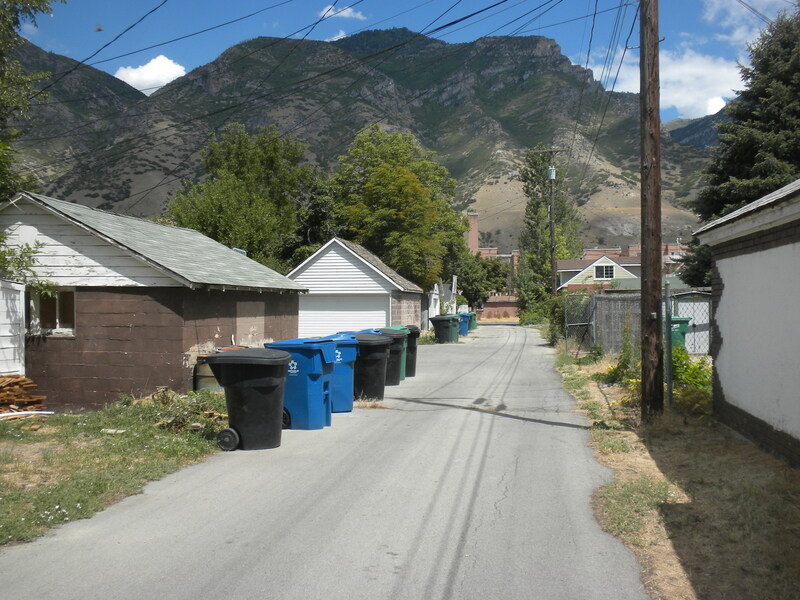 Unlike most parts of Provo, garbage is picked up in the alleyways behind the houses here. 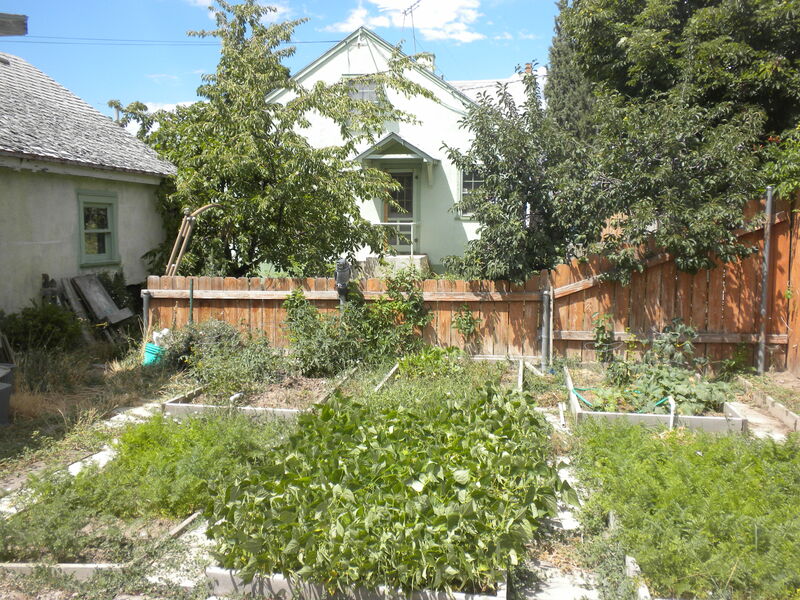 Walking through the alleyways of the Maeser neighborhood is a great way to check out gardens. As I mentioned above, this neighborhood is a bargain hunter’s paradise right now. It’s exactly the kind of place experts say people increasingly want — i.e. smaller dwellings in a walkable location — that hasn’t yet priced out the kind of people who’d be excited to live in these older homes. More importantly, it’s a model on various levels of how to build with both cars, people, and bikes in mind. 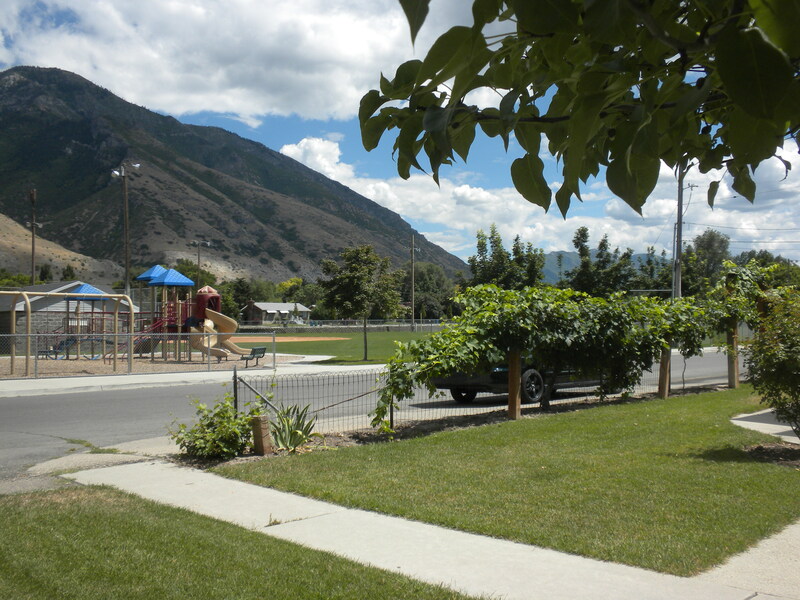 And though no neighborhood anywhere is perfect, this one succeeds better than most others in Utah County.